AnimalPets - Is Your Bird Overweight? Believe it or not, there is such a thing as a fat bird. Too many seeds, too little flying or climbing and suddenly you could be looking at a serious health problem. Here’s what you need to know to make sure your bird stays in fighting trim. Believe it or not, there is such a thing as a fat bird. Too many seeds, too little flying or climbing and suddenly you could be looking at a serious health problem. Here’s what you need to know to make sure your bird stays in shape. Obesity is a common health problem in captive birds, typically caused by poor nutrition and an all-seed diet. In the wild, birds get a lot of exercise flying from tree to tree, escaping predators and searching for food. In captivity, birds usually have their wings clipped. If they go anywhere, they usually walk or climb. Their diet is frequently high in fat and low in important nutrients. This situation is the avian equivalent of the person who sits on the couch all day long eating French fries and cheesecake! Check the breast muscle. The best way to tell if your bird is carrying an appropriate amount of weight is by looking at his breast muscle, which lies over a bone called the keel. When you look at your bird from the front, there should be a bone running down his midline. This is the keel. To either side of that bone there should be rounded muscle. If your bird is too fat, he’ll have “cleavage.” In other words, the keel bone won’t be the most prominent part of your bird’s chest. If your bird is too thin, he will feel bony to the side of the keel and the area alongside the keel will feel concave (curved in) rather than convex (curved out). Look for fat. You can also look for subcutaneous fat (below the skin). Feathers grow in tracts, so there will be areas that are non-feathered. One of these areas is along the side of the neck beginning at the base of the jaw. If you part your bird’s feathers to look at this area, you should easily be able to see his jugular vein. If the vein is difficult to see, and there’s a yellowish tint beneath the skin, your bird likely has subcutaneous fat and is getting chunky. Telltale signs. Other less specific signs of obesity may also be present. For example, if your bird gets out of breath with a small amount of exercise, it may be from carrying extra weight. Also, if your bird’s beak grows excessively long, it may be a sign of fatty liver disease, which is caused by obesity. Just as with people, it’s all diet and exercise. 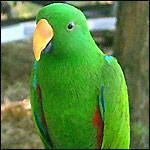 Get your bird on an appropriate diet of pellets, vegetables, some beans, rice, pasta and a very small amount of fruit. High-fat seeds and nuts are only for treats (the exception is the hyacinth macaw) and should be given in small amounts (one or two seeds) once or twice per week. Pellets should be left in the cage at all times. Home food should be left in the cage for no longer than 30 to 45 minutes at a time.